Entrees are served with rolls, your choice of homemade soup or dinner salad, smashed or baked potato (excludes Steakhouse Salad and Spaghetti or Pasta Dinner), Traditional Relish Trays are available for a nominal fee. 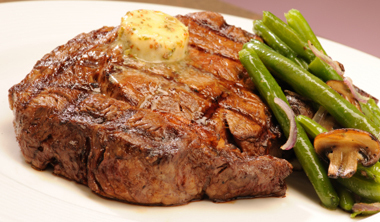 All of our steaks and chops are cut and prepared in-house to ensure quality and weight accuracy. Prime Cut steaks are offered. We also offer Non-Aged and traditionally authentic Dry-Aged steaks (natural aging process that tenderizes the meat and enhances the flavor). Eleven large shrimp crusted with seasoned breadcrumbs and broiled in garlic butter. Add: meatballs or italian sausage. Includes soup or salad only. Three broiled BBQ meatballs on garlic bread. Choice of cheese on request. Thick cut bacon, lettuce, tomato and avacado/sun-dried tomato mayo on sourdough bread with Swiss cheese. Balsamic marinated portabella with spinach, sun-dried tomatoes, roasted yellow peppers and melted provolone on multi grain focaccia with fresh tomato, cucumber and roasted garlic/fresh basil mayo. Five large hand-rolled pork/beef meatballs broiled in our homemade BBQ sauce. Topped with our blend of cheeses and broiled. Served with tortilla chips. Five cheeses, italian sausage, peppers, mushrooms and onions baked in roasted toamto sauce. Served with pizza crust chips.